Fear This! As featured in Maxim Magazine! 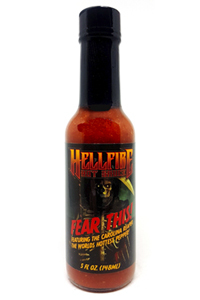 1st Place NYC XXXHot!This amazing multi award winning Reaper sauce features the fresh and all natural flavor of the new hottest pepper in the world! Even hotter than the Ghost or Scorpion peppers! Smokin' Ed's Carolina Reaper is the new reigning champion averaging a blistering 1.58 million scoville units of heat with peaks at 2.2 million!!!! With a pepper mash content of nearly 60% we have also added onions,garlic,sundried tomatoes,tomatillos,cilantro,lemon,lime,ginger and other spices to bring awesome flavor to the incredible heat of the Reaper! Needless to say this ALL NATURAL sauce is EXTREMELY HOT!!! USE CAUTION!!!! And Enjoy!!! !